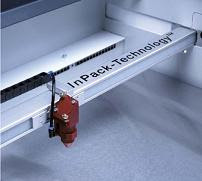 Trotec Laser Online Magazine: What's InPack-Technology™? A tiny explosion occurs when your laser fires. When the beam hits the material, tiny particles fly into the air. These hot, sticky, and dirty particles swirl around the laser cabinet exposing critical system components; such as optics, bearings, electronics, and motors. This results in premature wearing of these parts. Some laser companies call these parts "Consumables", meaning they have to be regularly replaced. Here at Trotec we have a different philosophy. When our engineers developed our first machine over 10 years ago, their goal was to develop a machine that would stand up to the harshest of environments. When you choose Trotec, you choose the highest quality the laser industry has to offer. Trotec engineers developed InPack-Technology™ to ensure our machines would out perform our competition. InPack-Technology™ encloses the optics, electronics, bearings, and belts to protect them from smoke, dust, and other contaminates. This means no dirt, no excessive wear, and no consumable items! InPack-Technology™ is one of the many reasons Trotec Lasers run faster and longer than the competition.